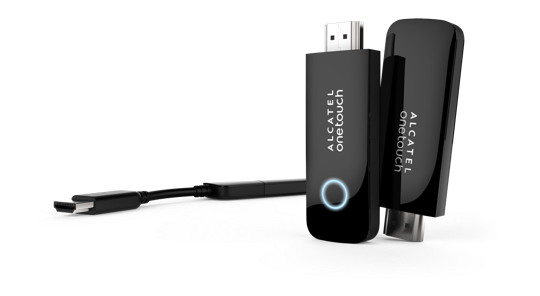 Alcatel has released a few details of their OneTouch Home V102 media streaming accessory. The device/dongle will work very similar to the Chromecast. Utilizing Miracast to bring your mobile screen to your big screen. It’s also competitively priced, meaning the Chromecast might have competition this summer. The Alcatel OneTouch Home V102 works with 5.1 channel surround sound, and can stream 1080p at 30fps. The only downside is that the device works with Android 4.2 and above, which although is most Android devices on the market, it still leaves quite a few who will not be able to use it. One Touch Home V102 will work with any Miracast certified device, so make sure you have a compliant TV before rushing out for one. The setup is extremely simple, too.You just have to plug in the adapter, hook it up to your HDMI port, and then set the WiFi connection. Alcatel isn’t yet saying how they plan to set the Wi-Fi connection for the dongle but, we suspect they will as the Chromecast has an app specifically for that feature. OneTouch Home V102 will be distributed in the European region, and be shipping in Q2 2014. Alcatel have competitively priced at approximately £40 (€49) which brings it right into the Chromecast price range. We do not know at this time where you will be able to buy it but, as soon as we know we’ll let you know.